SATG-series with its open tine bottom and sweep-in grapples offers the performance customers demand for site demolition debris, as well as rocks, brush, wood and metal. The patent pending design keeps the front rake of the sweep clamp open during use until the rear section of the clamp is either closed or contacts the material being handled. The cylinder then overcomes the spring pressure causing the front rake to rotate towards the bucket in a sweeping motion moving material in and retaining it in the bucket. View our literature. 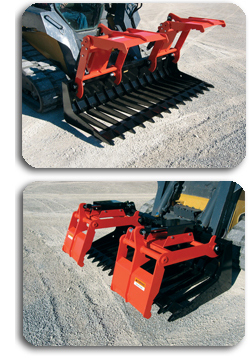 Suitable for site demolition debris, as well as rocks, brush, wood and metal. Patent pending design keeps the front rake of the sweep clamp open during use until the rear section of the clamp is either closed or contacts the material being handled.